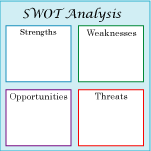 "Time saver for professional educators, free Powerpoint pack on the SWOT technique"
When you click on the link at the bottom of this paragraph, the MS Power Point presentation may open in your web browser, feel free to flick through the presentation. However, if you would like to save the presentation or to open the SWOT presentation in MS Power Point, you will need to save it first using the "save as" feature in your browser. Thank you for visiting our site, please forward the link to this Power point presentation to others who may get value from it.